Comfort, peace and tasteful elegance. Our love for details will instantly make you feel good with us. All information about your summer vacation 2019 can be found in our summer journal and price list. a very special winter season has finished. We thank you to ALL of our guests for really exciting moments. Please be informed that our hotel will be closed from March 25th 2019 until May 28th 2019. However our reception will be at your disposal for booking requests, reservations and for any other information. if we are not reachable by telephone please leave us a message on our telephone answering system. You can also write us a mail to info@leitlhof.com or use our form. It would be our pleasure to welcome you in the summer in our Hotel. We are nominated for the Leading Green Hotel of Europe! Once again we have been nominated in the Europe's Leading Green Hotel category of the World Travel Awards as one of the 15 best green and sustainable hotels in Europe. We thank you for your vote! Read more … We are nominated for the Leading Green Hotel of Europe! Enough snow for the whole winter! Such a beautiful winter landscape! Finally in the valley are about 60 cm of snow. In our 3 Zinnen Ski Resort, the ski slopes and cross-country ski trails are in perfect condition. Also snowshoeing is great fun. Everything is perfect for a winter fairy tale in the **** S Leitlhof - Dolomites. Read more … Enough snow for the whole winter! Welcome to the new year! Welcome to the anniversary year! For the New Year we wish you all the best, good luck, peace and health. We are looking forward to an eventful anniversary year "1250 years Innichen"
Here's our New Year's wishes! Read more … Welcome to the new year! Welcome to the anniversary year! The Christmas Market takes place every year from the end of November till the beginning of January. What our visitors like most: the love for detail, tradition and naturalness. Fans of the Dolomites all agree: The Tre Cime tourist region can rightly be described as a winter paradise. You can explore this wonderful snowy landscape on a network of convenient paths or more challenging trails, catching sight of the majestic Dolomites around every bend. Here you will find many possibilities in our region! Read more … So many possibilities! We proudly present the winter pricelist 2018/2019. Scroll here in our winter journal or download it here. We look forward to your inquiry and your visit. The summerseason has finished! We reopen 5th of december! a very special summer season finished. We thank our guests for really exciting moments. Read more … The summerseason has finished! We reopen 5th of december! Like the last year we are open from 30rd of may until the 4th of november. As a guest of our hotel you are allowed to use the cable cars in the period 8th October – 4th November 2018 for free. Make use of the free rental of bicycles, mountain bikes and cycling maps. We lend e-bikes and e-mountain bikes of the latest generation for a small fee. If you take your bike with you, our lockable bike room is at your disposal. Think about the summer vacation now! The upcoming summer season will start in the Leitlhof on Wednesday the 30th of May. Our hotel will be open again this year until the 4th of November. 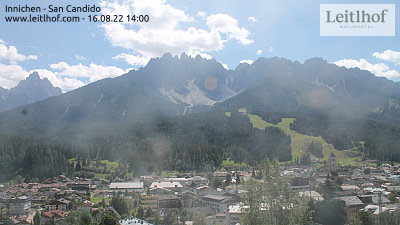 All offers for your holiday in the Dolomites can be found here on our website. Read more … Think about the summer vacation now! Eastern we give you 1 day for free! Traditional fish buffet on Good Friday Easter egg hunt on Easter Sunday for young and old. On the 30 december 2012 the power plant Spanner RE² was inaugurated. Today we celebrate the 5th anniversary. The big investment make it possible that the CO ² output was reduced by around two thirds. The guests of the hotel makes a climaneutral holiday without a CO2 output. Hip, hip, hooray for the next 5 years! The "3 Zinnen Mountain Club"
As a member of 3 Z Mountain, experience the exceptional: Moments reserved for just you and your friends. Enjoy special experiences, events, and offers especially created for you. Read more … The "3 Zinnen Mountain Club"
We hope you have "slipped" well into the new year. For environmental reasons, we have again renounced the traditional fireworks this year and have sent your wishes with balloons in the sky. The balloon that covers the longest flight is awarded. Both the finder and the "sender" can look forward to a gift. Everything else you will find it here. Read more … The winners have been announced! We are IMS partner company and we provide our guests with free tickets. On 27 September is the World Tourism Day! Its purpose is to foster awareness among the international community of the importance of tourism and its social, cultural, political and economic value. Read more … On 27 September is the World Tourism Day! Finally, we are connected to the fiber-optic Internet! This high-speed connection enables you to surf the internet quickly on your holiday. Consciously, we have set a very strong connection to enable our guests in the virtual world the maximum comfort. We are again one of the bests Europe’s Leading Green Hotels. We are nominate again for the category "Leading Green Hotel" and we under top 12 hotels in Europe. In November 2015, the United Nations General Assembly declared 2017 the "International Year of Sustainable Tourism for Development". We from the Hotel Leitlhof - Dolomiten are delighted that we have already fully fulfilled the measures taken in the decision-making process for several years. The areal images give you a special view to our hotel. The World Travel Awards, the “Oscars“ of the tourism industry, are awarded each year to top tourism businesses. >>> MAKE YOUR REQUEST NOW with the key "Blackfriday"! and the new connecting floor. Our hotel could prevail and occupy the very good second place as a climate-neutral and also one of the few energy-independent hotels in the world in the category "Travel" at a major international competition at the Green Tec Awards 2016. We are very proud and happy! We are pleased to receive the award for Green Leader / Eco Leader platinum level by TripAdvisor. This is the highest level in the Green Leader / Eco Leader program, which distinguishes particular sustainable hotels. We select for you some special photos of the winterseason 2015/2016. Click here to see them! We get some new panoramic views on our webcam page. Click here for the new views to the Sextner Dolomiten. One of the many highlights during your holiday week: The night skiing and night tobogganing every Tuesday and Friday from 19 clock at Haunold in San Candido. Our hotel is among the TOP 10 projects in the Travel category of 2016’s GreenTec Awards, Europe’s biggest environmental and business prize. New at the Leitlhof: the biological and sustainable skin treatment "made in Südtirol"
Enjoy an environmentally-friendly and relaxed holiday. With the HolidayPass you can get around the Sextner Dolomiten and the whole South Tyrol even without a car. This is made possible by this special card, with which our guests can make use of all public transport throughout South Tyrol free of charge. The last Messner Mountain Museum has opened the 24th July 2015 and is open daily from 10 am to 4 pm. It lies on 2.275 m at Corones and is therefore the highest museum of South Tirol. We open for the summer season! 29th of may we open our hotel for the summerseason. The Mühlmann family and the staff of the Leitlhof is very happy to get you a warmly welcome. Read more … We open for the summer season! Worldwide, there are 46 "green pearls". There are hotels that offer in unique places sustainable and green holiday. The Leitlhof as a second carbon-neutral hotel in South Tyrol fulfils perfectly the criteria of Green Pearls Unique Places. The by Climate Partner certified and unique CO2 balance and the many initiatives for green and sustainable holiday have helped that our hotel was included in the exclusive circle of "green pearls". We are members of the Wanderhotels and we offer to you the best hiking and trekking opportunities. Our hiking guide Hermann gives you tips and he will accompany you three times a week to hiking and mountain climbing in the Dolomites. Free access to the internet! Another news for the summer: we activate a new internetconnection for our guests. Free internet access in the whole hotel! Read more … Free access to the internet! New at the Leitlhof: We offer you just the right conditions for your workshops, seminars, training sessions or meetings. Our conference room has everything you need for your presentations and seminars. In Alta Pusteria much snow! We in the southern part of the Alps are very blessed in this winter with the snow. In the valley are about 80 cm of snow. The ski slopes in the Dolomites are in perfect conditions and also the cross-country and snowshoe trails are well-rolled daily. A perfect winter wonderland in the **** S Leitlhof - Dolomites Living Nothing stands in the way. Read more … In Alta Pusteria much snow! From winter 2013/2014 is available to our guests our new ski room free of charge. This is equipped with lockable cupboards and boxes. The boxes are equipped also with boot dryers. So your ski boots are cozy and warm in the morning! One of our news for the winter season 2013/2014: The 2nd shuttle bus. Our guests can be left the car and reach the ski slopes comfortably and without stress. Sustainable and free!